I have for you, a nice picture of a pretty little lady today! She’s even showing off a flat little stomach. She also seems to be a bit shy about baring her midriff though, doesn’t she? Until you look at it a little closer, though, you may not realize that there’s more to this standing illusion than meets the eye at first. Do you see something a little off about this standing illusion after looking at it a little closer? I’ll give you a little hint—look behind her legs. If you look closely, you can see another pair of legs hiding back there. Those are that adorable little lady’s real legs. 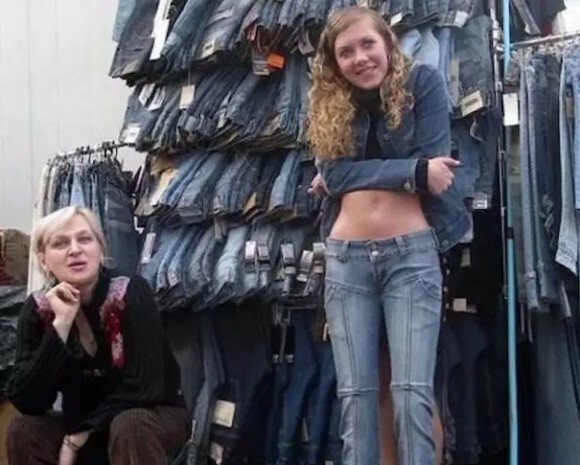 The bare belly and legs wearing jeans are actually a mannequin that the woman is leaning on. But, I’ll bet it had you fooled for a bit, didn’t it? Like this standing illusion? Check out this kid with chubby legs next! Phew.. for a second there i thought you were serious!! Woah, a web site redesign. That explains the lack of new posts, but still no recent posts since then.